Pocket GNU Go is a port of GNU Go for Windows Mobile devices including Pocket PC and Smartphone. There is a complete app with GUI based on the 2.6.4 (I believe) GNU Go build available at http://www.vieka.com/gnugo/. There is also a 3.4 port in the works (see http://www.vieka.com/forum/topic.asp?TOPIC_ID=111) and this build is released with GoSuite. It is currently being worked on by Sidney Liu. 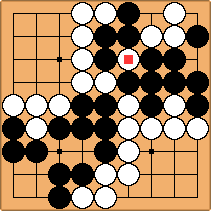 Pocket GNU Go was initiallly created by Ivan Davtchev from Harvard University based on GNU Go 1.2, developed by Man Li and others. Later Alex Seewald from the Austrian AI Research Institute upgraded it to a more advanced AI, using GNU Go 2.6. Ivan Davtchev added multithread capabilities and upgraded it to GNU Go 2.6.2. To further separate the backend GNU Go engine and front end user interface development, Sidney Liu from Vieka joined Pocket GNU Go project and also looked over the maintainence, support and promotion responsibilities.